Decision Diagnostics Corp (OTCMKTS:DECN) staged a huge rally today on the company’s update regarding its litigation against J&J LifeScan. DECN announced that it has opened a lawsuit against J&J and its LifeScan divisions. Its litigation is seeking damages and compensation between $400 million and $700 million for incidences of infringement against two separate patents. 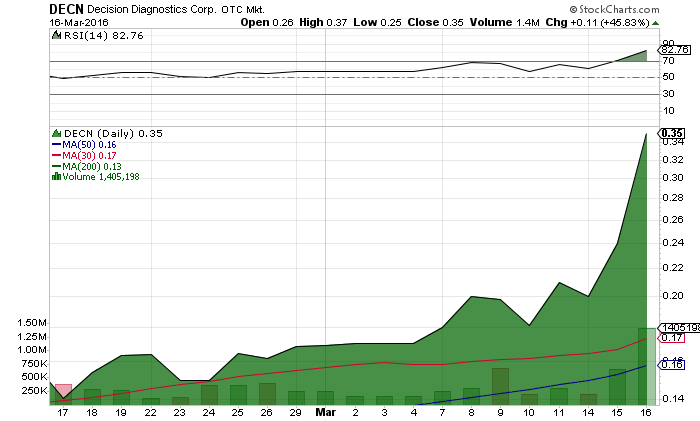 MicroCap Spotlight previously wrote about this on March 11 and the stock has gained 100% since our feature. J&J LifeScan divisions received huge revenues in excess of $2 billion in each of the last six years. DECN has hired a nationally prominent legal counsel in the arena of patents. Legal counsel has strongly urged the pursuit of legal action after an extensive review. It is such a clear patent violation that there is no other course DECN could pursue. Even if just a fraction of the awards and damages are received through a settlement, say 10%, DECN and its subsidiaries would receive windfall award of $40 million and $70 million. The stock could potentially double or triple from such settlement. Given the $2 billion annual revenues (roughly $12 billion over the six years), this seems to be a small settlement versus going to court and receiving willful infringement damages. DECN is currently trading at a $23 million market valuation. Given the recent developments of the new lawsuit against J&J, DECN could see significant awards either through a settlement or a jury awarding damages. In addition to the fact the company has developed several new products ready for release should further ignite this exciting story. Stay tuned as we will update as more developments come available.